Asteroid Bennu has been under close scrutiny since December. Here are six key results from the first few months of data from OSIRIS-REx. The Origins, Spectral Interpretation, Resource Identification, Security, Regolith Explorer (OSIRIS-REx) arrived at a nearby asteroid called 101955 Bennu on 3 December 2018. The NASA mission aims to study the composition and physics of this near-Earth asteroid, collect a sample from its surface, and return that sample to Earth. Bennu is both reassuringly familiar and startlingly strange for an asteroid of its kind. On 10 March 2019, mission scientists published a collection of papers that share some of the first results from the mission and discussed those results in a press conference. The first looks at the data show that Bennu is both reassuringly familiar and startlingly strange for an asteroid of its kind. Despite Bennu’s surprises, the team has “great confidence that we’re going to be able to target a Bullseye TAG [touch-and-go] event for summer of 2020 and get that precious sample for stow and return back to Earth,” said Dante Lauretta, OSIRIS-REx principal investigator from the University of Arizona in Tucson. For more details, here are six key results from the first few months of observations from OSIRIS-REx. Perhaps the most surprising discovery about Bennu so far is the detection of several particle ejection events from the surface of the asteroid using data from OSIRIS-REx’s navigational camera. “Just 6 days after we got into orbit, we observed our first particle event,” said OSIRIS-REx flight navigator Coralie Adam. The science and engineering groups quickly worked together to create tools to detect and analyze the ejections. The team detected 11 particle ejection events between 11 January and 18 February and continues to monitor for more. Some events ejected more than 100 particles. “This is definitely not what we expected to see,” he said. The ejecta initially caused some worries for the team. “We were modestly concerned about particles being ejected from the surface of the asteroid unexpectedly,” said Rich Burns, OSIRIS-REx project manager at NASA Goddard Space Flight Center in Greenbelt, Md. A quick assessment showed that “the spacecraft was safe in orbit” and the likelihood of a collision was very low, Burns said. The researchers have not yet assessed whether there will be an added risk during the sample collection maneuver. They expect that more data will reveal where the ejections come from, what mechanism may cause them, or how frequently they may occur. The team is also working with observatories to identify a hypothetical “Bennid” meteor shower resulting from Bennu’s particle ejections, which could recur in September in Southern Hemisphere skies. “We had expected from ground-based infrared and radio astronomy that the ground was relatively smooth and dominated by centimeter-scale particles, which are optimal for our touch-and-go sample acquisition mechanism,” Lauretta said. The unexpectedly rough surface caused some initial concern about the sample collection maneuver. “The asteroid is so rugged that there is unlikely to be any 25-meter-radius hazard-free zone,” Burns said. OSIRIS-REx was optimized to target an area of that size for its touch-and-go sample collection. The team has identified smaller areas with finer-grained regolith that it says are perfect for the sample collection and should not pose navigational difficulty. “We have demonstrated meter-level navigation accuracy, which is even better than the Earth-based GPS on your cell phone,” Adam said. “Our predicted navigational accuracy is 10 times better than what we expected before we arrived at Bennu,” she said, and the craft should be able to do a so-called Bullseye TAG maneuver in the summer of 2020. “Bennu has an expected spinning-top shape,” Lauretta said. “It’s roughly spherical with an equatorial ridge that seems to be dominated by its rotation.” But Bennu’s bulk density is much lower than would be expected for a solid object. “It’s a pile of rubble,” he said, basically “gravel and boulders loosely bound together by their own small gravity field.” In this respect, Bennu is similar to some other asteroids, like Ryugu and Itokawa, visited by spacecraft. As much as 60% of Bennu might be empty space. 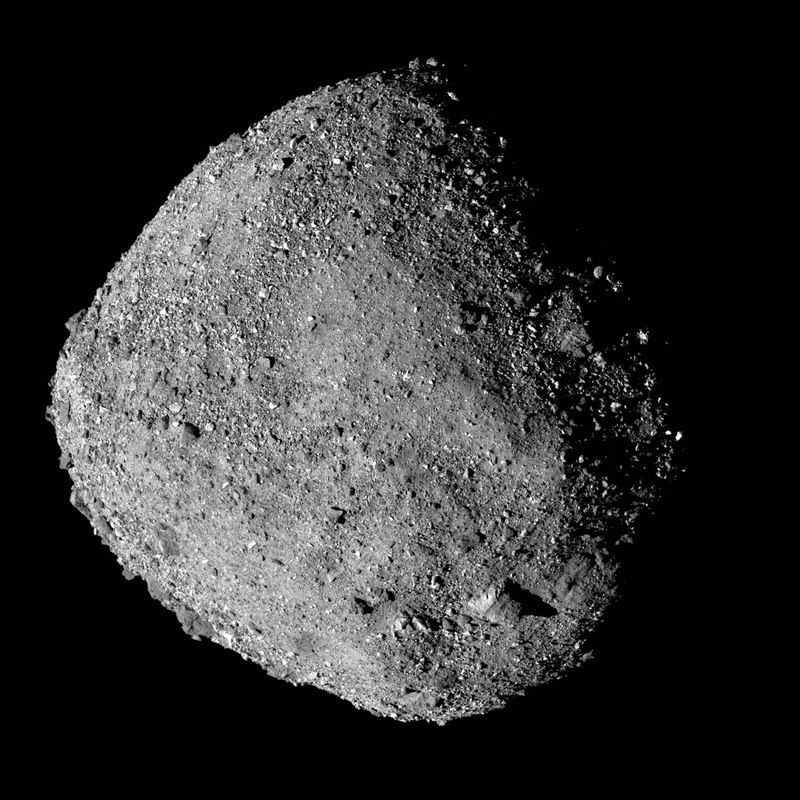 However, Bennu’s boulders physically look a lot different than hand samples of CM meteorites. “The nature of the boulders [is] suggesting that there’s more to the story than we know from our meteorite samples so far,” Lauretta said. Bennu rotates once every 4.3 hours, but that rotation is slowly speeding up. Every day, the asteroid rotates about 4 millionths of a degree more than it did the day before. A key goal of OSIRIS-REx is to study the YORP effect up close and better understand how it can change the orbits of near-Earth asteroids. “In about 1.5 million years, we predict that Bennu will be spinning at twice its current rate,” Lauretta said. Backtracking this acceleration would suggest that Bennu wasn’t rotating at all just 8 million years ago—which is pretty unlikely, Lauretta said, so the acceleration must be a relatively new phenomenon. You can learn more about the YORP effect in the video below. Bennu’s surface is between 100 million and 1 billion years old, which likely dates back before it shifted from the main asteroid belt to near-Earth space. Many boulders on the surface are cracked, which tells a tale of thermal stress and impacts. Piles of boulders at low elevation points, a lack of small craters, and partially filled-in large craters suggest that loose surface material has shifted from the poles to the equator during the past million years in landslide-like events, Lauretta said. This might be due to the rotational acceleration, the particle rain, or a combination of effects. OSIRIS-REx has about 2 years left at Bennu. During that time, the craft will continue to study the asteroid’s surface and near-surface environments and select a good touchdown site. The mission is expected to return in 2023. Citation: Cartier, K. M. S. (2019), All about Bennu: A rubble pile with a lot of surprises, Eos, 100, https://doi.org/10.1029/2019EO118773. Published on 21 March 2019.